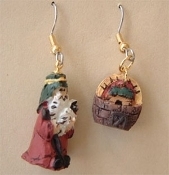 Funky Mismatched NOAH with ARK EARRINGS - God's Rainbow Promise Resin Novelty Spiritual Faith Charm Costume Jewelry, approx. 1/2-inch (1.25cm) tall. Bible School Religion Teacher Spirit gift!